Megani-Iwa (female deity rock) at Basenkyo, Ninohe City. Mabechi River, northern part of Iwate Prefecture, has a place of scenic beauty of gigantic and unusual rocks, named Basenkyo by Kenkichi KOKUBUN, the first elected governor. 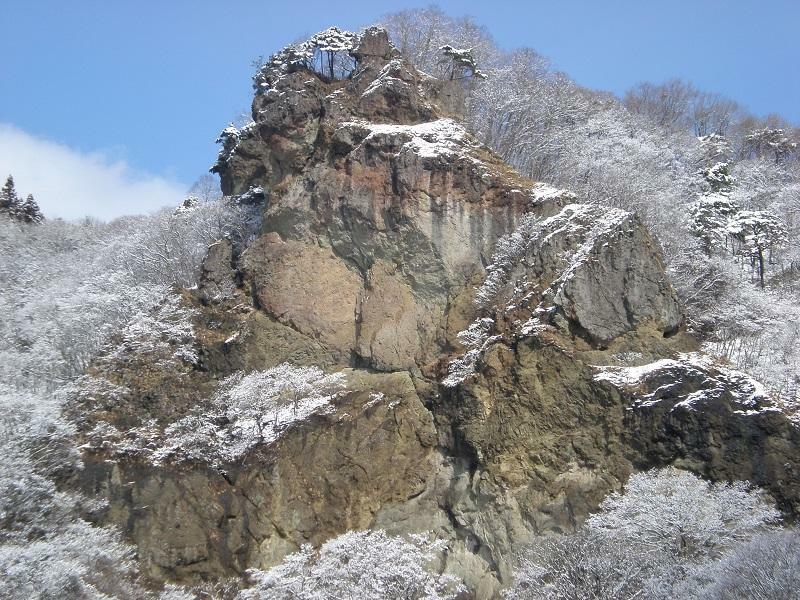 Basenkyo includes Ogami-Iwa (male deity rock), Megami-Iwa (female), and Ohogake cliff, composed of basaltic-andesite--decite volcanic rocks (Aikawa volcanic rock Member, Suenomatuyama Formation) erupted under shallow marine condition in the early middle Miocene. This member is underlain by shallow marine sandstone, which fortunately yields well-preserved diatom tests. Diatom stratigraphy in this area was well correlated to that on deep sea drilling cores off Sanriku, and contributed an early development of north Pacific diatom statigraphy, in addition to the radiometric ages of this member, Photo shows Megami-Iwa, subdivided into lower massive lava and upper hyaloclastic volcanic breccia. The stratigraphy of the Miocene “Saikawa Formation” distributed in the southern Kanazawa area, Ishikawa Prefecture, is revised based on litho- and biostratigraphic studies. The previously defined “Saikawa Formation” is divided here into the Yamashina, Saikawa (redefined), and Koderayama formations in ascending order. The Yamashina Formation consists mainly of mudstone and contains diatoms which indicate ca.15.6–15.4 Ma within the diatom zone NPD4A. The Saikawa Formation is composed mainly of coarse-grained sandstone and the obtained diatoms were considered to be reworked. However, calcareous nannofossils of the zone CN5a (13.6–11.8 Ma) were reported from the Saikawa Formation in a previous study. These data indicate that the Saikawa Formation unconformably overlies the Yamashina Formation. The Koderayama Formation is characterized mainly by fine-grained sandstone with a basal conglomerate bed eroding the upper part of the Saikawa Formation. The Koderayama Formation in turn is eroded by a conglomerate bed of the overlying Pleistocene Omma Formation. The Koderayama Formation includes endocarps of Carya (Juglandaceae) which became extinct in Japan before 3 Ma. Therefore, the Omma Formation should unconformably overlie the Koderayama Formation with a sedimentary hiatus of more than 1.3 million years. The Daisen-Kurayoshi tephra (DKP) is one of significant wide-spreading fallouts along the Japanese islands during the Late Pleistocene time. However, its stratigraphic position had not been fixed in NE Japan, because there was a conflict among previous studies. In this paper, I have analyzed major compositions of volcanic glasses within tephra layers, which were correlated with DKP in NE Japan, and compared dataset from the SG06 varve core (Smith et al., Quaternary Science Reviews, vol. 67, p. 121–137, 2013). New results have revealed that the San-in 1 tephra (SAN1) immediately above the Numazawa-Mizunuma tephra (Nm-MZ) was mistaken as DKP around Mt. Bandai. The revised tephrostratigraphy in this region consists of DKP, Nm-MZ and SAN1 in ascending order. Diatom occurence from the Miocene in the Ichinohe district, nothern part of Iwate Prefecture, NE Japan. A marine diatom biostratigraphic analysis was carried on the Miocene strata distributed in the Ichinohe district, Iwate Prefecture, Northeastern Japan. In this report, the biostratigraphic distribution and quantitative abundance of diatoms from the Kadonosawa, Suenomatuyama, Zyūmonzi, Yanagisawa, and Shitazaki formations are documented.